Local Partnership Earns Ohio Association of Community College Award Hess Corporation Manager of Utica Operations, Rob Williams, accepts the OACC 2015 Outstanding Business Partnership Award from Belmont College President, Dr. Paul Gasparro. 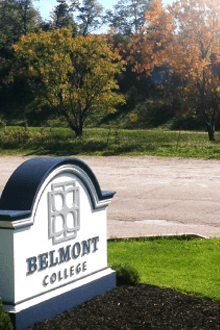 St. Clairsville, OH (July 29, 2015) – Belmont College is pleased to announce that their ongoing partnership with Hess Corporation is now award winning. News 2015 News 2014 News 2013 News 2012 News 2011 News 2010 Aspiring Engineers Test Their Skills at Annual Belmont College TEAMS Competition Wheeling Park High School Team B took 9th & 10th first place at Belmont College’s 2015 TEAMS competition. Wheeling Park High School Team A took 11th & 12th first place at Belmont College’s 2015 TEAMS competition. News 2015 News 2014 News 2013 News 2012 News 2011 News 2010 Belmont College January Board Meeting St. Clairsville, OH (January 16, 2014) – Belmont College will hold its monthly Board of Trustees meeting Thursday, January 22, 2015 in the Board Room at the Main Campus in St. Clairsville beginning at 7:00 p.m. Please visit belmontcollege.edu for more information.